Thursday May 3rd 1900 I did baking and churning this forenoon and got dinner early. I went up to the funeral of George [Pond?] who was brought here to be buried. I called at Eugene Harts awhile and came directly home. It was a cold ugly ride. did the evening work. Friday May 4th 1900 Will took the butter to town today. I did a lot of sweeping and washing windows, cleaned the silver and dressed a turkey for dinner tomorrow. It was a nice day to work. Will came home early. 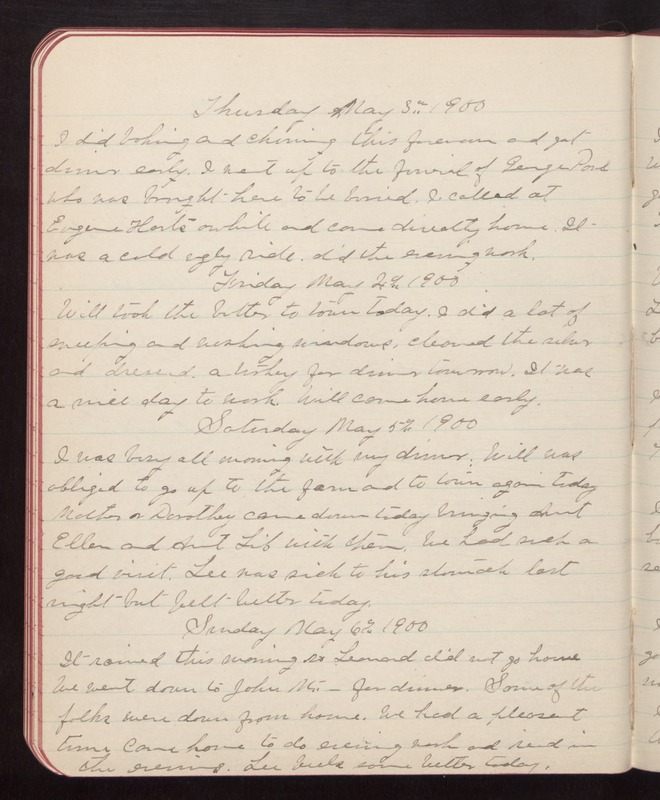 Saturday May 5th 1900 I was busy all morning with my dinner. Will was obliged to go up to the farm and to town again today Mother & Dorothy came down today bringing Aunt Ellen and Aunt Lib with them. We had such a good visit. Lee was sick to his stomach last night but felt better today. Sunday May 6th 1900 It rained this morning so Leonard did not go home We went down to John Mc.- for dinner. Some of the folks were down from home. We had a pleasant time Came home to do evening work and read in the evening. Lee feels some better today.